This week was our First Annual (?) Talent Show, aka Rotapalooza! A Really Big Shoe! In lieu of the usual pledge of allegiance and invocation, past President Don McMillan (hereinafter referred to as “Donny Mac” led us in singing the National Anthem, which we performed waaay better than Roseanne Barr did back when. 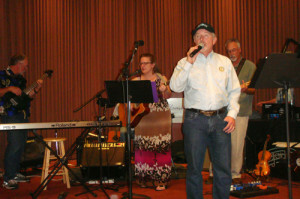 The Rotary All Star Band, with Donny Mac on vocals, Layne Bowen on lead guitar, Karen Ball on acoustic guitar, Dennis Ball (husband of Karen) on electric bass guitar, and Darren Elliott on drums, started us off with a laid back version of the Eagles’ (remember the ‘70’s?) hit song “Take It Easy”. Dancing ensued, with John McHugh cutting a rug with a mystery woman in a green dress, and Nona Lucas dancing with Joy Parker’s husband Bob. Rumors, anyone? Jeff Gospe arrived. 5 ½ hours after the markets closed. What’s up with that? rendition of “Matchbox”, with backup by Layne Bowen and Dennis Ball. choice. Right after being told that Donny Mac used to serenade and romance Jackie McMillan with Eagles songs, he sings a song about a woman who’s committing adultery? Hmmmm. The next act caused my 9 year old daughter, Emilie, to jump off my lap and stand on her tip toes for a better look, because we had a real treat: Shannon McConnell performing a ballet dance. 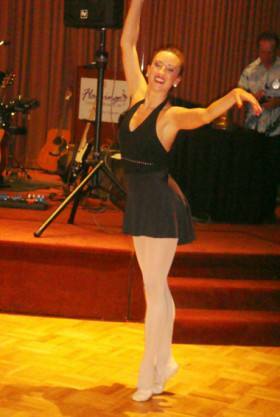 Her moves were beautiful and her hand and arm work were exquisite. Really very nice. Jose Guillen showed real machismo (the good kind) in taking on Las Mananitas. He claimed he has no talent and asked us to imagine that he was singing at 3 a.m., but the crowd went wild as he serenaded birthday girl Mel Burchill. Donny Mac and the Band came back and sang some unknown country song no one at my table recognized. He made us stand up while he sang – maybe he realized we can’t take country sitting down? I am informed by my editor, musician extraordinaire Layne Bowen, that the song was “The Bug” by Mark Knopfler. Of course! Robert Pierce got up and danced with Ginny Cannon. The Burchills hit the dance floor, and Mike Kallhoff tried to sabotage my notes! The Band was back with Donny Mac and they finally sang some rock n’ roll: the Rolling Stones’ “Honky Tonk Women”, which got people singing. 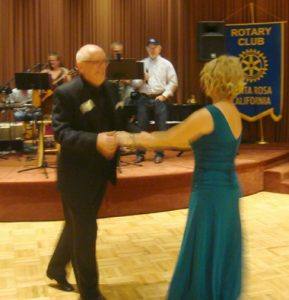 Bob Parker finally danced with his own wife, Joy. Layne Bowen then showed us some real talent with his fiddle, playing a Scottish Aire and some Irish jigs. Very nice! 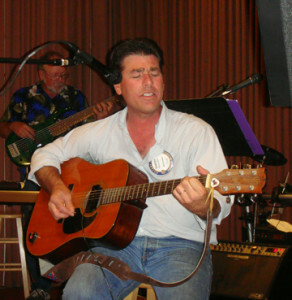 Darren Elliott then channeled his inner Bob Dylan and sang a song he wrote during Desert Storm, back when “these colors do not run” and school closings. Your editor did not catch the name of the song (might have been “A Piece of Mind”) but the most repeated lyric was “Don’t be stupid and ask me if I’m fine”. Donny Mac – impersonating Johnny Cash – and Karen Ball sang a duet: “Jackson”. That strange black hat was actually a wig! The image of Don swinging his hips like that will be long remembered. John McHugh and Barbara MacDougall then treated us to a waltz. To the oldie but goodie “Fascination”. Black suit, white tie, major bling, and a big smile. Way to go, John! Karen Ball then gave us a torch song: “At Last”, which got a lot of Rotarians up to dance: Darren Elliott was spotted hitting on Peggy Soberanis, Debi Zaft got out there with Sam McMillan, and Nona Lucas was spotted with Robert Pierce. There were lots of other couples out there dancing and having a great time. 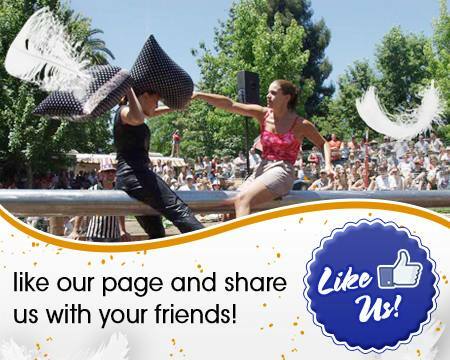 Now that the Giro Bello is over, it is time to focus on the Pillow Fights that will be on Saturday September 27th at Sonoma Mountain Village. Wayne Rowlands gave us a brief history of the world famous pillow fights put on by the Kenwood Fire Fighters since 1964. They became so famous that in the last year they were held in Kenwood, over 10,000 people came! It was just too much for the tiny town of Kenwood so they had no choice but to shut it down. At the August 6th club meeting, our speaker will be Richard Gulson, a polio survivor and voice of the Pillow Fights. This first year we are limiting the crowd to 5000 people. There will be at least one celebrity bout between Tyler Rex and Brian Cage. They have approached the sororities and fraternities at Sonoma State University for the Battle of the Greeks. There will be a kid’s play area sponsored by Tiger Kick that will have a jumpy house, climbing wall and an obstacle course. There will be 3 bands playing during the day; Heros Turn Human, Pacific Haze and the Shannon Rider Band. 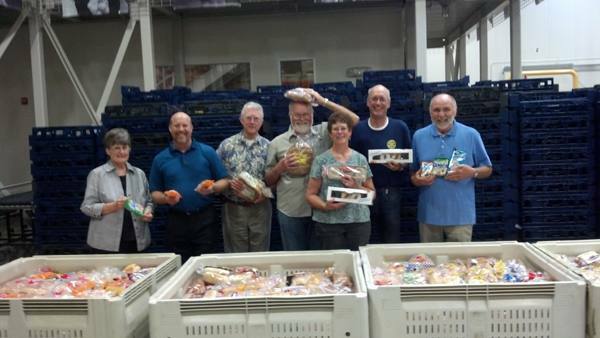 Lagunitas Beer, Mary’s Pizza Shack and Sally Tomatoes have signed on to provide food. Facebook, Twitter and the website are actively marketing the event. Tickets are available and can be bought on Eventbrite. Sonoma Media Group will be our radio advertising partner. Important! At our meeting on August 27th we will have an ABC Training class for serving alcohol. If you or any of your family or friends will be helping with the alcohol at this event, they do need to take the training. Invite them to the August meeting! That’s it! How much more fun can we stand!!!!!!!!!!!!!! Great job on this July 30, 2014 Bulletin – love your chatter on the goings on. You describe all that great talent so well I’m really sorry I missed it. Love the Eagles too! Gotta break loose of this work stuff and get back with Rotary. You all are having so much fun and performing such great deeds. Thank you for the compliments on the writing. However, I just post the bulletins, the credit goes to this week’s author and editor Julia Parranto!